My husband loves Butterfinger candy bars, so I am putting them in brownies. It is his birthday week, so he gets all his favorites. 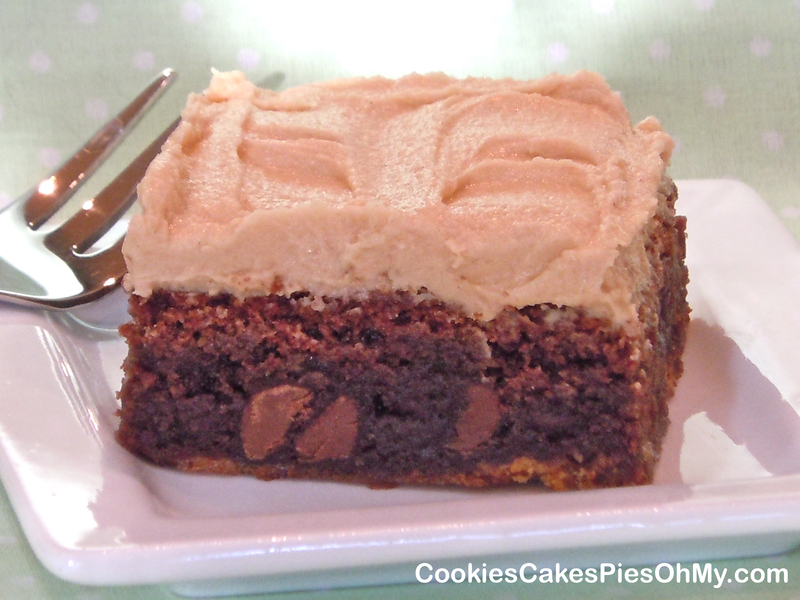 In my opinion, brownies are wonderful, but frosted brownies are the best. Preheat oven to 350°. Line 13”x9” baking pan with foil, ends extending over sides. Spray thoroughly with non-stick spray. In large mixing bowl, by hand, stir together butter and cocoa. Add sugar, eggs, and vanilla, beat until well combined. Add flour, baking powder, and salt, beat until dry ingredients mixed in. Fold in milk chocolate chips and chopped candy bars. Pour into prepared pan. Bake 30-35 minutes, until set in center. Cool completely. Pull brownies out of pan using foil overhang and set on cutting board. Peel foil away from sides. Frost with peanut butter cream frosting. Whip all ingredients together with electric mixer and frost completely cooled brownies.